Lisbon is just fantastic, if you have time, go for longer than a day. There is just too much to try and squeeze in and our day out really doesn’t do it justice. The great thing about Lisbon is wandering around the city, most of the attractions are outside, so if you are on a budget it’s an easy city to pace yourself and your budget, people watch and look around. It’s jam packed full of ruins, cathedrals, squares, a great city for walking and deliberately getting lost navigating your way through the winding narrow streets. Lisbon has developed into a cosmopolitain city and continues to do so. A perfect blend of the old and new. It is a rival for any European city and is being hailed as the new Barcelona, a fantastic place for a city break. A ‘safe’ destination to travel to. One thing it’s not advisable to do, is drive into Lisbon. We were taking Grandma back to the airport and travelling from central Portugal, so we had a car. Lisbon is undergoing a massive redevelopment at the moment, particularly to the waterfront. Roadwords, building work and traffic chaos. If you have to drive, avoid the waterfront or check traffic reports first. There are a lot of one way only streets, particularly in the older parts of the Alfama and around the Sé Cathedral. Parking is also at a premium and hard to find. That said, it’s not that bad for a European city, if I would definitely go by car again if I needed to, but would make wiser route choices. Our trip centred around the neighbourhoods of the Alfama, with it’s winding lanes and Fado filled clubs and restaurants; Castelo, strangely enough where the castle and some great viewpoints are (a climb up from the Alfama), and Baixa, a shopaholics paradise and the heart of old Lisbon. Once we had finally negotiated our underground, overnight car park, we checked into our apartment, which by the way was stunning, on the doorstep of Sé Catedral de Santa Catarina, a great base to explore old Lisbon. Sé Cathedral is a stunning building and We picked up the vintage Tram 28 outside the Cathedral, this is in all the guide books and supposed to give you the ultimate tour of Lisbon for the bargain price of €2.85. What the guide books don’t tell you though is that the ticket is is only for one ride. We had obviously left our brains in Central Portugal and forgotten what it was like to be in the big city, we assumed we could hop on and off…er, no. We hopped off the tram after a couple of stops at the viewpoint, the nearest stop to the castle and thought we could get back on again but once a ticket is used, that’s it. Don’t make the same mistake we did, stay on for a long trip (up to 45 minutes) to get your money’s worth. The viewpoint, Miradouro de Santa Luzia, affords you sensational visas of the city, a great place to take some photographs of the beautiful buildings of Lisbon. From the miradouro the logical next step is to go to see the castle. The Castelo de São Jorge is sits on the hill above Lisbon, steeped in history the castle is worth a visit if you have time and the €7.50pp entrance fee. We continued on to find something to eat. Lisbon is overflowing with stupendous seafood and a sumptuous variety of eateries to suit every budget. We saw some of the city whilst walking to the Cervejaria Ramiro, it is pretty popular and you can’t book so arrive early. The array of seafood available is just phenomenal. The ordering is a little daunting as you pay per kilo but the waiters are really helpful. By this point Chaos and Mayhem were exhausted and hitting the wall, the last thing they wanted to do was be still in a formal restaurant. After an inquisitive Mayhem smashed a plate, the seasoned waiters dished out the chupa chups…if in doubt, the Portuguese give the kids lollies. They must’ve thought it was a dire situation as they gave the kids three each! Failed as parents…one lollipop each and the sugar magic staved off their boredom until the seafood arrived. Wow, it was worth dosing the kids up, what glorious seafood. Everyone stole some of Grandma’s tiger prawns, with the juices mopped up with the free garlic toast, they were the best…ultimate…If you even remotely a foodie, a visit to Cervejaria Ramiro is by far well worth the trip to Lisbon alone! Feeling suitably stuffed, the boys had a nap in the carriers whilst we navigated our way across and downhill along the Avenida da Liberdade. There are so many shops and malls in Lisbon, you really can find whatever you desire…unless you have two little people with you and no opportunity whatsoever to shop! So window shopping it was, which was probably best with the heavy price tags of all the designer labels, from Prada to Cartier, you can find them all here. Heading further into the heart of Lisbon we made our way onto the Rua Augusta, Lisbon’s mosaic tiled main pedestrian street. if you are looking to soak up the atmosphere in the a central spot then this is a great place to grab a bite to eat or uma bica, the only kind of coffee to drink in Lisbon, a strong espresso. By the way, drinking coffee is a serious business in Portugal. The rest of Portugal you would order um café. If your tastes are a little weaker try meia de leite, half coffee, half milk in a cup with a handle, usually foamy on top, or Um galão, 3/4 milk, served in a tall glass, and is closest to a latté. There are many other variations as Portugal truly is a nation of café lovers. At the end of the Rua Augusta is the magnificent Rua Augusta Arch (Arco da Rua Augusta). You can use the lift to travel up to the top of the terrace for amazing views of the city and waterfront. The Archway leads you to Europe’s largest commercial square, the Praça do Comércio. Praça do Comércio, Terreiro do Paço, or the Palace’s square, is simply monumental. Surrounding the square are 18th Century arcades full of shops and cafes, brilliant for people watching. You can visit the tourist information office, the World’s Poshest Toilet (go figure) and the city’s oldest cafe, Cafe Martinho Da Arcada. Relax and soak up the atmosphere. All that walking had made us thirsty so heading back towards Sé Cathedral we popped into Tábuas Porto Wine Tavern. This small but perfectly formed wine cellar is just so visually appealing, it oozes vintage and coziness. Rather on the pricey side for food, well, bar snacks but a great selection of ports and wines. Just perfect after a long day walking. Before going back to our amazing air bnb apartment we made lightening tour of fortress like Sé Cathedral. Built in the 1150’s on the site of a recaptured moorish mosque. 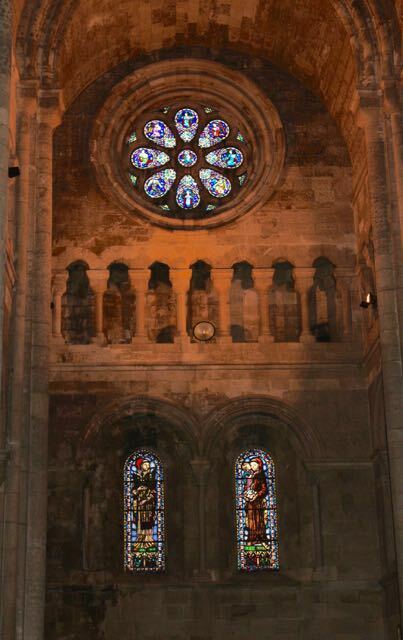 It was beautifully restored in the 1930’s, It’s highlight was the striking rose coloured stained glass window. After a jump around in the apartment we headed out in the hope of obtaining an early dinner. Early is sometimes difficult in Portugal, whereas the kids normally eat their dinner at 5pm, it’s virtually impossible to find any restaurants open until 7pm. There are of course some and cafe style places but Hubbie really wanted grilled sardines so we went on a mission through the winding alleyways of the Alfama. Unfortunatley sometimes guide books are not as current as they should be and the highly recommended sardinhas eatery, Patio 13 had closed and been swallowed up by Lisbon’s regenerative building works. The walk there had really whet our appetites though and the atmospheric Alfama looked as though it came alive in the evening. Alas, we didn’t have the chance to find out, made a hasty exit from the narrow alleyways and went on the search for anywhere nearby, open at 6.30 and that could grill the elusive sardines. We ended up heading to the very touristy, rather tacky, bargain eateries of the waterfront. Luckily though, most were open and one had sardines on the menu! 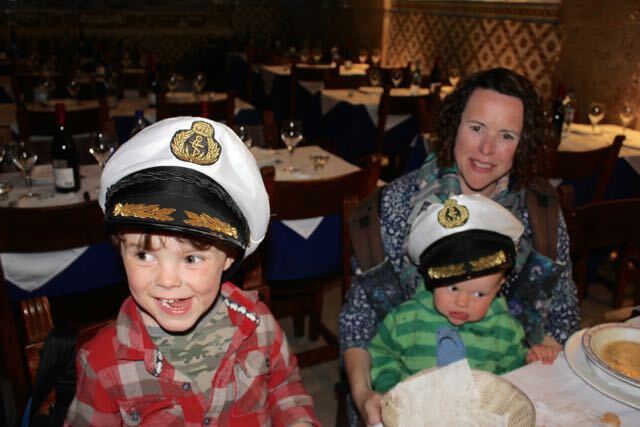 Aye, aye, Captain, all aboard the Mariners Restaurant, complete with waiters dressed as sailors, we knew it was a quality place! If you are looking for cheap and cheerful, head to the waterfront! Actually, the food was great, severed quickly and the kids were entertained by the waiters, putting silly hats on and opening and closing the serving cupboard behind our table. Most satisfyingly of all though, Hubbie got his grilled sardines. Thank Goodness. Aye Aye Captain! The Mariners Restaurant.